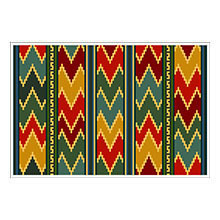 Balouch Stripe, while based on an original rug pattern from the 11th or 12th Century, can be both contemporary and traditional. By changing the colors and depending on the setting and companion pillows, a whole range of design possibilities exist. 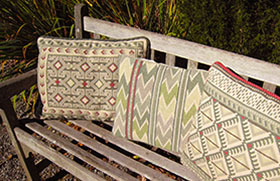 For the first time, I am making companion pillows available at the same discount of 20% off Retail. The blues shown above speak to me of “summer” and magazines are currently showing blue and white, an ever popular combination.The webpage shows at least 12 companion pillows in the same blues. The beauty of our Balouch Stripe pattern is that it blends so well with a large number of other patterns in the cross-point™ collection. 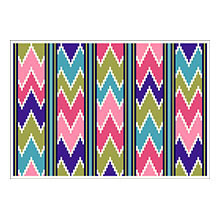 Please visit the cross-point™ website to see more examples on the pattern page. 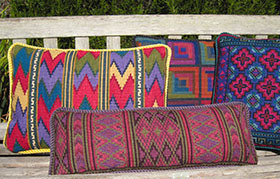 In the photo above, #BAL-ST-01 is shown with jewel color related Morocco Stripe #MORST-03 in the foreground, Pisac #PISA-02 at right, Log Cabin #LOG-03 in the background.Other companion pillows are Chevron #CHE-03, Nilos #NIL-01, and, our most popular pattern – especially for beginners – Berber Stripe #BEBP-03. 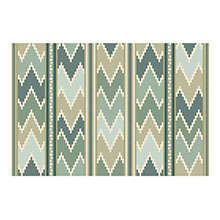 Balouch Stripe in one pillow sizes is available in six color choices, from pastels to primary. 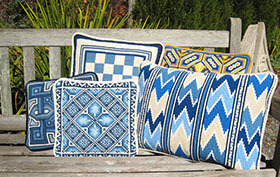 This entry was posted in Blue & White colors for summer stitching, Blue & Yellow colors for summer stitching, cross-point Color Schemes, cross-point kits, Historic Balouch Pattern, Historic Kilim patterns, Historic Textile Patterns, Meadow & Field colors for summer stitching and tagged About cross-point, Balouch stitching pattern, blue & white pillows, blue & yellow pillows, color schemes for stitching, cross stitch kits, cross-point, Elle Decor magazine, Historic textiles, Interior Design, Kilim stitching patterns, Morocco Stripe, Morocco Stripe Pattern, needlepoint kits, primary colors, upholstery designs, Veranda magazine. Bookmark the permalink.